Foodoholic Pro is a premium Multipurpose WordPress theme for restaurants that is clean, simple, and aesthetically pleasing. It comes with incredible features which has been crafted with minimal design to put your food first. 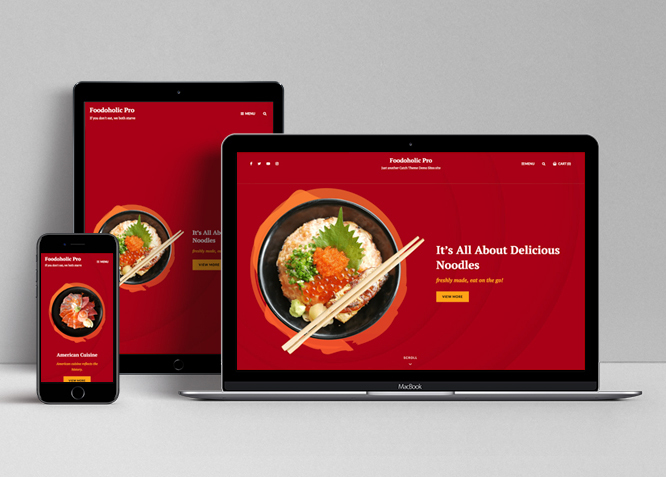 Foodoholic Pro is a completely aesthetic and eye-appealing, carefully crafted multipurpose restaurant WordPress theme that expects nothing but the highest quality and performance. 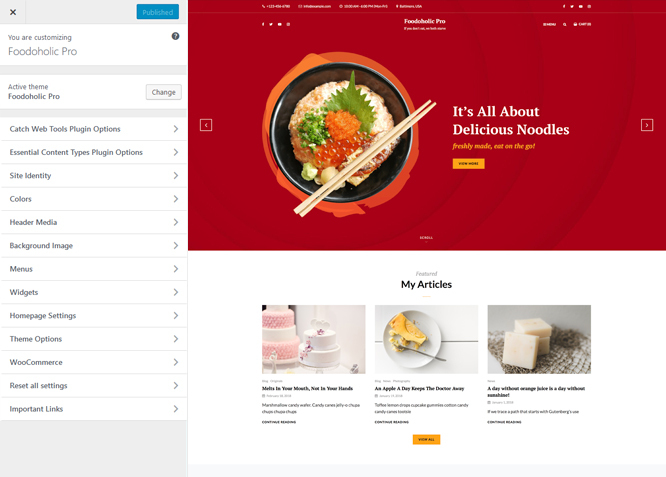 It comes with basic crucial features—such as contact info, events, food menus, gallery, header top, menu options, portfolio, promotion headline, reservation, sections sorter, stats, testimonials and more –that you expect from a decent restaurant WordPress theme to flaunt your restaurant business. 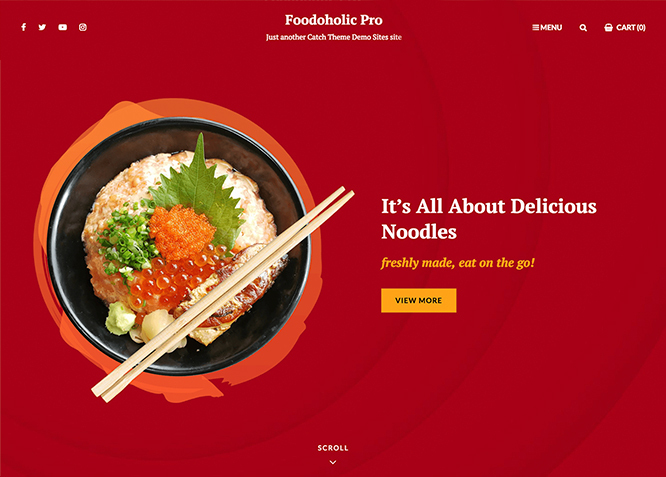 With Foodoholic Pro, you can create your very own stylish and delicious-looking website in a matter of minutes. And also, Foodoholic Pro is translation-ready. Foodoholic Pro offers exciting Menu Options! This theme supports and recommends using "Custom Menus". You can create Custom Menu through "Appearance => Menus" from your WordPress Dashboard. You can assign your custom menu in 4 different locations. You assign it either from "Appearance => Customize => Menus => Manage Location" or from "Appearance => Menus => Manage Location"
#How to add Contact Info in theme? Foodoholic Pro supports 4 featured slider types they are: 1. Post , 2. Page, 3. Category and 4. Custom. For Featured Slider Options, go to "Appearance => Customize => Theme Options =>Featured Slider". Foodoholic Pro supports Header Top Option there you can add basic information. Go to "Appearence => Customize =>Theme Options => Header Top"
#How to add Reservation in theme? Foodoholic Pro supports Reservation in theme, with option you can add reservation feature in theme where your can add reservation details like contact info, weekend description, weekends titles. It has option for Reservation Left section for basic information and Reservation Form in right section as form. Go to "Appearence => Customize =>Theme Options => Reservation"
Under "Reservation Form(Right Section)" enable by click in "Enable Reservation Form on", then select type as "Post", "Page" or "Custom"
#How to add Events in theme? Foodoholic Pro supports 4 Hero Content types to choose from:1. Post , 2. Page, 3. Category and 4. Custom. For Hero Content Options, go to "Appearance => Customize => Theme Options => Hero Content Options". Foodoholic Pro has 2 Site Layout, 4 Default Layout, 4 Homepage/Archive Layout, 3 Archive Content Layout, 2 Archive Display Meta, 3 Single Page/Post Image and 4 Woocommerce Layout options image layout to choose from "Appearance => Customize => Theme Options => Layout Options"
Once you are in Layout Options, you can Check the box below "Single Page/Post Image Layout" which will set our posts/page image layout. Further, you have the choice of selecting Single Page/Post Image Layout for individual pages and posts through "higher-education Options => Single Page/Post Image Layout", which you shall find below individual posts and pages, when you click on them for adding/editing. Foodoholic Pro supports section sorter. The Sections Sorter is a feature that allows you to organize various sections on your website by manually sorting them. You can now rearrange and put forward the section that you want your visitors to see first. Foodoholic Pro currently has 17 widgetized (Sidebar) areas thay are: 1. Sidebar, 2. Footer One, 3. Footer Two, 4. Footer Three, 5. Footer Four, 6. WooCommerce Sidebar, 7. Content Bottom 1, 8. Content Bottom 2, 9. 404 Page Not Found Content, 10. Optional Homepage Sidebar, 11. Optional Archive Sidebar, 12. Optional Page Sidebar, 13. Optional Post Sidebar, 14. Optionals Sidebar One, 15. Optional Sidebar Two, 16. Optional Sidebar Three and 17. Newsletter. Go to "Appearance => Widgets" or "Appearance => Customize => Widgets" in WordPress. Foodoholic Pro has 2 Widgets to choose from. They are: 1. CT: History Widgets and 2. CT: Social Icons. You can add widget in widget area as per your need.